Lev is a half Russian, half Japanese. However he says he doesn't speak Russian because he was born and raised in Japan. His name in Russian means lion. Lev wasn't around when Karasuno and Nekoma had their first match together. He started playing volleyball in high school, that's why he was still a novice and spent whole time on bench at that time so he didn't come. Lev is blessed with natural physical ability, intuition and height. He declares that he's an ace even though he's a middle blocker. Kenma states that Lev is a good and honest guy. Lev is quite childish and cheerful, shown when he was making fun of Hinata's height. 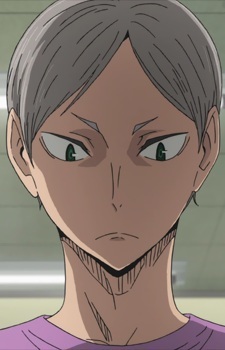 Lev's appearance, as well as his piercing eyes, causes people to believe he is much more intimidating and serious than he actually is. Though he can be blunt, he never seems to mean any harm and adopts a playful attitude towards most things. He is also shown to be enthusiastic about spiking as he gets excited about it very easily, and can be competitive with people he is interested in.